This does not constitute investment advice. Returns mentioned herein are in no way a guarantee or promise of future returns. Mutual Fund investments are subject to market risks. It seems like yesterday that we came up with a great plan to make investing uber-easy for you. We figured that investing in mutual funds had been a complex issue then. It was rather hard to find out which funds to invest in. And even if you knew through our premium mutual fund research service ‘FundSelect’, the whole process of asset allocation and diversification was rather foreign to most investors in those days. We had come across a lot of questions like these. During our intense brainstorming sessions, one of our team members came up with a great idea. And so was born one of our most successful and highly sought after service, FundSelect Plus - A Ready to invest model mutual fund portfolio service. ✔ Wasting hours in front of the TV for a few scheme names from so-called “experts”. ✔ Asking close relatives for their favorite mutual fund at the family party. Yes, things can get crazy at times, when we are talking about something as serious as Financial Freedom. To relieve them of such pain, FundSelect Plus exists today. If you’re looking for high risk and high reward investments, we have it ready for you. If you’re looking for lower risk stable investments, we have it too. FundSelect Plus is the ANSWER to the fast, crazy world of mutual fund investing. If you are an investor who “likes to have everything ready beforehand”, WITHOUT any effort on your part whatsoever, FundSelect Plus is for you. Well that’s what we intended FundSelect Plus to be when it was launched in 2007. FundSelect Plus is the flagship research product of PersonalFN, and over the years we have received overwhelming response from our subscribers from across the country. "One good thing I find with PersonalFN is that they work on Fee based model and there are very few chances. Also with the FundSelect Plus Service, they have launched a good concept of model portfolios. Now for my short term goals, I can align them with Conservative Equity portfolio or Debt portfolio for 3 months. This is really a great flexibility where one can assign each of his goal, according to short/long term nature with a relevant portfolio model. With this service I feel like a portfolio manager without taking hassel or investing much time." The truth is, we envisaged FundSelect Plus to be the “ready portfolio advisor” for our smart Indian investors. At PersonalFN, we always endeavoured to empower investors in their journey toward Financial Freedom. ...more so, for someone who is bogged down with personal and professional responsibilities. FundSelect Plus was our teamed effort to make the whole investing process easier for you. 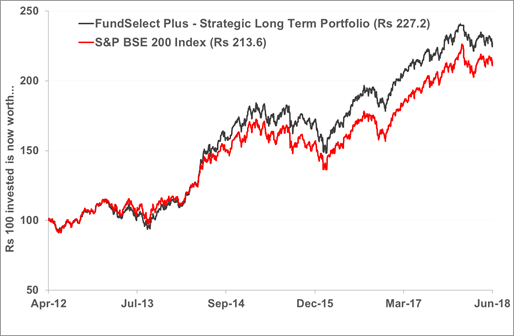 FundSelect Plus strove to offer you with immense power to build readymade portfolios that bring in potentially double or even TRIPLE digit returns in the long run without any extra work on your part whatsoever! Well, did it perform as we expected? To start with, we prepared 6 portfolios in total. Three of them were focused on equity investments and the rest were for debt investments. Let's look at how each of them performed over time. This is high risk and high reward equity mutual fund portfolio, and primarily aimed at investors with ABOVE AVERAGE risk appetite. But you see, we follow a stringent and time-tested methodology of selecting mutual funds for you to consider investing in...or in simpler words, this portfolio is well optimized to curtail market risk to the minimum possible. But still investing in growth-oriented equity mutual funds can be risky just as they can be supremely lucrative if done with a clever investment strategy. However, our stringent process helps us select right funds and frankly speaking, it has fared very well for us till now. 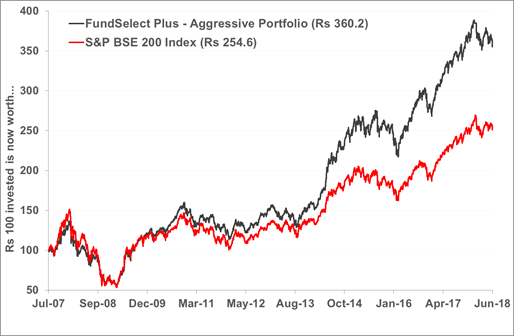 The FundSelect Plus - Aggressive Portfolio has returned an absolute 260.3% since inception, compared to 154.6% of S&P BSE-200 Index. So, for every Rs 100 invested in the Aggressive Portfolio in 2007, it would have total to Rs 360 today. Isn�t that amazing? Well, let’s take a look at the Moderate Portfolio �of FundSelect Plus now. The Moderate Portfolio is meant for the risk-averse investors who can tolerate moderate risk in hope of higher investment returns than average. This is highly optimized portfolio that takes lot of “tinkering” to get the RIGHT BALANCE of risk and returns. 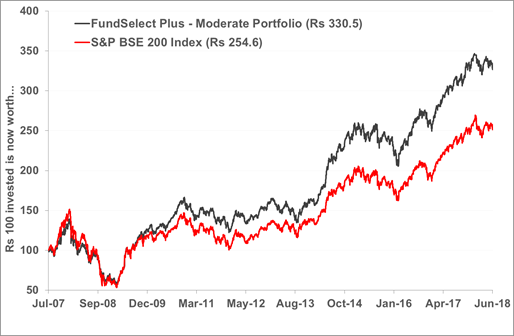 The FundSelect Plus - Moderate Portfolio returned 230% in the last 11 years, compared to 154% of S&P BSE-200 Index. That's 76 Percent Over that of the S&P BSE-200 Index! Do we have something to boast about? Well, our loyal followers (thanks to you, guys!) say so. We really appreciate the good words and feel that we have achieved a LOT just by empowering you in your journey to Financial Freedom. But wait! Have we neglected our Conservative Investor friends? Here comes the Conservative Portfolio� the one for the investors who want to invest in equity but don’t want to bear significant market risk. Trust us when we say that we took extra pains with this portfolio. Creating a portfolio that delivers high investment returns yet at nominal risk is hard, to be honest. It needs constant attention and care to be of any good to our investors. How good are our results? Check it out for yourselves. 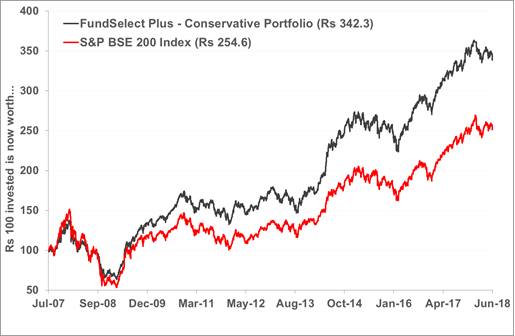 The FundSelect Plus - Conservative Portfolio fetched investors an absolute return of around 242% in 11 years time, compared to the meagre 154% of S&P BSE 200 Index. Not conservative at all, right? 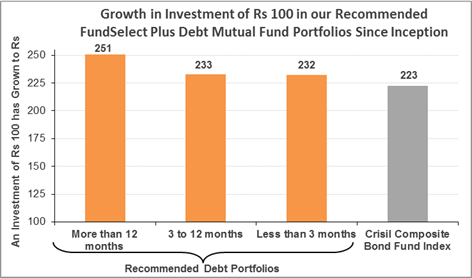 Our recommended portfolio has grown at around 11.8% CAGR compared to S&P BSE 200 Index�s 8.9% CAGR. For all those who put their faith on us and staked their capital in our portfolio, they gained an extra Rs 80 on every Rs 100 they invested. Not bad, eh? Well, in our set of equity portfolios, we also added a special “Strategic Long Term” Portfolio in the year 2012, which is different from the other portfolios we mentioned above. Well, this Strategic Portfolio is purely meant for long term investors. It is based on a proven and time-tested investment technique that lets you ensure long-term capital growth and even enjoy short-term rewarding opportunities. This portfolio consists of carefully selected stable and consistent diversified equity mutual funds (in India), which are designed to benefit from the growth potential of the Indian economy. While building this portfolio, we followed a pure long term portfolio building strategy. It is diversified across investment style and fund management, while each fund is true to its investment style and mandate. �On differentiated investment styles with greater focus on optimum portfolio allocation. Even when the portfolio was optimized to move with the economy for enhanced stability and boosted returns, it brought in decent returns above that of S&P BSE 200 Index! That is, if you invested Rs 1,00,000 in capital in this portfolio, 6 years back, it would have grown to around Rs 227,000, compared to Rs 213,000 in the broader market index. In case you are wondering, as a FundSelect Plus subscriber, you would get access to ALL these recommended equity fund portfolios, closely monitored by PersonalFN’s Research Team, for full one year. 3 months, 3-12 months, and more than 12 months. As you would already know, a debt mutual fund is for the retirees, pensioners and other investors who prefer relatively safe and stable income investments. And keeping that in mind, we prepared three portfolios that are constructed to serve as a steady income source for the investors. They needed to serve two purposes, viz. bring in higher than returns provided by risk-free assets and be more or less steady throughout the investment period. And we mean returns FAR higher than that of fixed deposits. As you can see above, if we compare the performance of our recommended debt portfolios vis-�-vis Crisil Composite Bond Fund Index over a period of 11 years, two of our recommended debt portfolios slightly outperformed it, while our �More-than-12-months�Debt Portfolio surpassed the Crisil Composite Bond Fund Index by over 27 percent!. ...They have also been steadily doing so for A DECADE! Nevertheless, FundSelect Plus also offers recommendation on prominent Tax Saving mutual funds. With a special Tax Saving Funds Portfolio, FundSelect Plus will also provide you a list of our top recommended tax saving funds that you can consider investing in for your tax saving needs in a financial year. As a FundSelect Plus subscriber, you would have ALL these 7 ready-to-invest premium mutual fund portfolios with high performance potential at your disposal. Portfolios that have already generated up to NINETY PERCENT higher returns than the market over a decade. Portfolios those are closely tracked and monitored by our research team. So, whether you are an equity or debt investor, you could have taken your pick and allocated your capital in the right proportion for optimum results. All you needed to do was just take action! But since you are reading this letter now, we are going to assume that you missed your golden opportunity already...we mean, once. Are you going to lose it again? Perhaps, you didn’t take investing seriously before. Perhaps, you couldn’t decide whether to go with us or not. So, don’t miss this chance AGAIN! Wouldn’t you want to be one of those lucky investors who could boast of their investment gains in the years to come? We understand that investing in anything requires some serious thought. And when it’s about your Financial Freedom, you surely don’t want to commit any mistake. Well, here’s a takeaway for you. Our research tells us that the next decade is going to be interesting (and in financial language, it means “highly lucrative”). India takes a big leap in World Bank's Ease of Doing Business rankings, moving up from 142 in 2014 to 100 in 2017. This is an external recognition of the government's relentless efforts in making the country an easier place to do business. India has a surging middle-class population with better access to technology, higher literacy rate and increase expendable income. The Modi-led NDA Government is all set to increase the governmental capital expenditure in the coming few years. With solid growth expectations, India, Inc. too is poised well to grow in the 8-10 years and that means, we, as investors, have more than one reason to rejoice. If you were ever thinking of starting to invest or taking investing more seriously, here’s our suggestion. Even if you don’t subscribe to FundSelect Plus today, we want you to keep this in mind. If you invest in the RIGHT mutual funds, you might have a strong chance of beating the market by potentially double or even TRIPLE digit returns in the next 8-10 years! But, only if you invest in the “ones worth investing”. So, don’t miss this great wave of investment success. Who knows you might retire in the next 10 years and be enjoying your life of freedom? We do hope so for you. And in case you need a portfolio to invest in and you don’t know how to build one, why look any further? FundSelect Plus is what you are looking for. To be honest, we want to help you with our financial knowledge and experience that we have gathered in the last 18 years (since the day PersonalFN was born). Our existence is for one purpose only. To take you toward Financial Freedom. Yes, we do charge a fee in return but we hope you understand that it is only nominal for the immense value that we aim to provide you with. Currently, the FundSelect Plus service is worth Rs 10,000 every year. But what do you get in return? Okay, that doesn’t sound too convincing? A Few Extra Benefits For You! With the change in market sentiments, a lot of equity funds, whether open-ended or close-ended, are cropping up every day. We will assess each one of those New Fund Offers (NFOs) and examine their viability as an investment avenue through our NFO Reports. And that comes for FREE with your subscription! Let us accept a stark fact today. There is simply too much noise around. Most of the brokerage houses, media, financial portals and various finance blogs...all are ready with their "expert" views and opinions on what's going on in the market. But can you really trust all of them? Probably no. In fact, we, at PersonalFN, believe that your chance of losing money multiplies when you follow someone else's bad advice, instead of doing a bit of research yourself. That is why we ensure that our monthly investment ideas provide a well-studied and factual opinion of the markets, cutting out the unnecessary noise around and help the investor make smart choices every day. 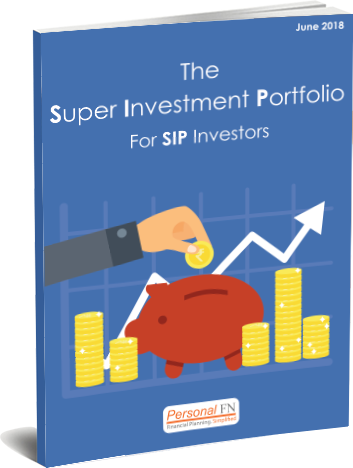 We also want you to benefit from a rare opportunity of creating a SIP-Worthy Portfolio! This special portfolio comprises of 5 SIP-worthy equity mutual funds that together come with solid potential of market-beating returns on your investment in future. These time-tested, lucrative SIP-Worthy funds can be invested in either separately or as a portfolio. They are chosen across differentiated investment styles. They have a strong and consistent track record. They follow steady investment strategies. They do not overlap with each other. They are managed by competent and experienced fund managers. Each of these funds has been carefully selected for their SIP-worthiness. Overall, it is an ultimate solution for SIP investors. Though this report is worth Rs 2,000, considering the HUGE benefit that it will render to its users, we have decided to offer it for ‘Free’ to our new FundSelect Plus subscribers. As a FundSelect Plus subscriber, we also want you to make the right decisions...always. That comes with complete knowledge of the science and art of mutual fund investing. And that's why we have brought to you our exclusive guide on mutual fund investing. And as a FundSelect Plus subscriber, you can get it for FREE�without any charge at all! 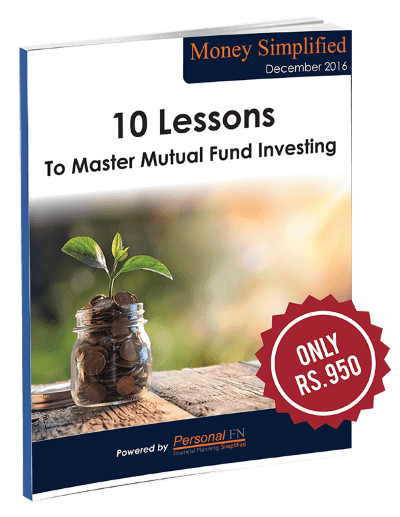 Free Special Report � "The Super Investment Portfolio"
Free Exclusive Guide � "10 Lessons To Master Mutual Fund Investing"
However, if you would ask us, all these do not matter more than the peace of mind that you get in return. Not spending hours in front of the TV. Not scouring through the financial journals. No fear of building a sub-par portfolio with NO good prospects. No fear of failing your financial goals. FundSelect Plus relieves you of the limitations and paves a smooth and easier way for you to start investing today. What would a few thousand rupees be worth if it could make you sleep peacefully at nights, knowing that your tomorrow is going to be happy and blissful? You, being an investor, would better understand. We want to make it more special for our loyal followers like you? So, if you were thinking of reaching in your pocket for ten grand now to make the best investment of your life, hold on right now. Something that would make this once in a lifetime opportunity for you. 50% on the 1st Year Subscription Fee? Though the usual subscription fee is valued at Rs 10,000 per year, we make it even more affordable for you. For a one full year of subscription, you have to pay Rs 4,950 only. Yes, by signing up right now, you can straight away save Rs 5,050 on your first year�s subscription fee. Even though the initial price is not high in itself, we wanted to make it even more special for you. And honestly speaking, this is our way of showing our appreciation to your steady love and support that you have shown all these years. We exist only to make your life happier and more successful. And we decided that curtailing the subscription fee might be a great opportunity for all our readers who always wished to try FundSelect Plus but shied away because of the price. Nothing should stop you from availing this golden opportunity now. Look, you really don’t want to start on square one every year complaining that you are helpless and clueless, and that you don’t know how to invest for market-beating gains? We are offering you this exclusive chance to build your financial future for better security and stability. We are offering you full and unrestricted 1-year access to our recommended SEVEN top-performing readymade portfolios with extreme growth potential. Extra 3 Months Subscription For FREE � No Charge At All! You get a full year subscription at the heavily discounted price and it doesn’t end there. We would also be adding in another 3 months to your subscription. So, instead of a 12-months subscription, you will get 15-months subscription at the SAME price! So, if you do the math, it comes to a heavy discount of over 50 PERCENT! Over the years We have seen how other investors make the right decision and go for this little investment and in turn, reap insanely huge gains over the years. "When I look back, the timely advise and assurances of PFN, quite contrary to experts on TV during the last years downturn not only saved me from huge loss, it helped to maximise my return in the cycle. I once again thank you all in PersonalFN for educating common investors and unbiased advice." Now, we don’t want you to miss this great opportunity. You could’ve been one of those smart investors, right? See how much you like it. Don’t worry. You have the option to try FundSelect Plus absolutely risk-free for 30 days from the date of your subscription. 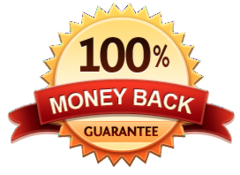 If you are not satisfied, just contact us within the 31st day and we will refund your money back � No quibble, no hassle! But tell you what, we are sure you won’t. Because this is the ticket to a better financial tomorrow. This is a not just any financial product or a service. We are offering you an once-in-a-lifetime opportunity to build your path to Financial Freedom. Enjoy your life with your family and friends. Remember, opportunity doesn’t knock twice! If you said yes, there’s nothing stopping you from attaining Financial Freedom. P. S. This is time-limited offer. It’s now or never! Click Here to Avail A Massive Discount of Over 50% on Your 1 Year Subscription Fee Of FundSelect Plus. Hurry today! P. P. S. Whether you are an equity or debt investor, take your pick from these top-performing, well-optimized SEVEN readymade portfolios and start reaping investment gains in the long term. P. P. P. S. This is not a personalized portfolio recommendation service. Subscribers are supposed to do their due diligence like analysing their risk appetite and consider their time horizon before making any investment decision. In case you are not sure about it, you may take the opinion of your investment advisor.